This is a small gallery post before I do a full article on the Scandi Edge jig. French Nail Trench knife. 3/8″ steel stock. Custom made for someone. RRS Scandi. Full steel. 1040 no temper. Runic engraving. Lanyard hole. Stag Scandi 1080 steel. shallow edge. Has some errors but is a good piece. French Nail Zombie Apocalypse Rebar version. HC. This entry was posted on May 17, 2012 by .. 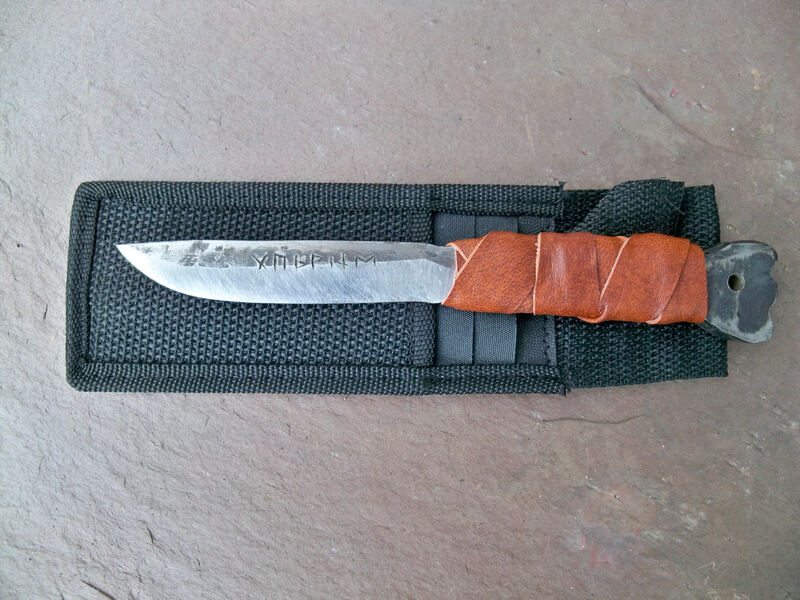 It was filed under Knife making-Blacksmithing and was tagged with 1080 steel, black smith, blade making, deer antler, edge jig, french nail, knife edging, Knife making, norse, Rebar Knife, scandi 1080, scandi edge, scandi knife, smith work, stag handle, steel recycle, Viking. Nice work! I really like your approach to your art. I can’t wait to receive mine. Thanks for the feed back. Keep an eye on my shop for more Scandi knives, I am getting close to hasving a stable functioning shop space so I will be producing more knives this summer! Hi, yes that is my own knife and in fact the first knife I ever started forging. I only just this year decided to use my improved skills on it. PS: it means “Battle Friend” translated.